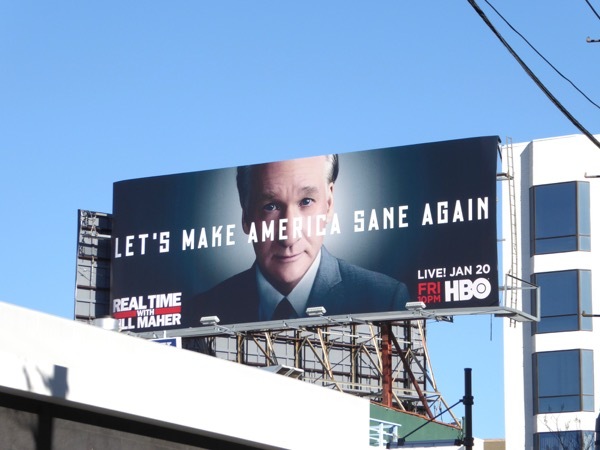 Today is Inauguration Day in the United States of America and for millions of citizens it feels like the world has turned upside-down, so these 'Let's Make America Sane Again' billboards for the fifteenth season of Real Time with Bill Maher are more timely than ever. 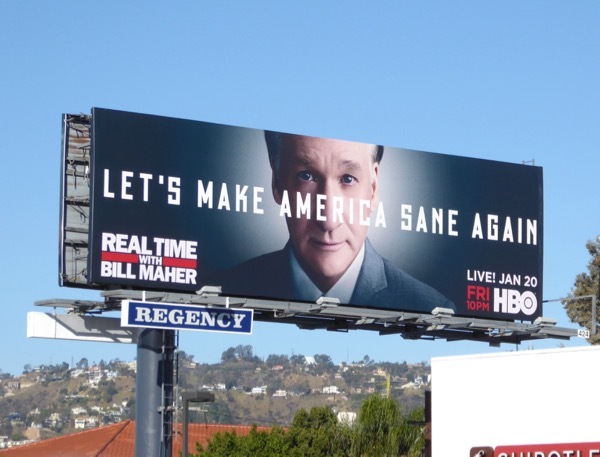 Whether it be foreign governments like Russia hacking the U.S. Democratic Party, the FBI favouring one candidate over another, a world where being 'Liberal' receives the same disdain as being a 'Communist' in the past (which is highly ironic), and an incoming narcissistic President so thin-skinned that a sketch on SNL angers him more than 20 million Americans losing affordable healthcare with no real plan to replace it, there's lots for the stand-up comedian and political commentator and his guests to talk about this season. 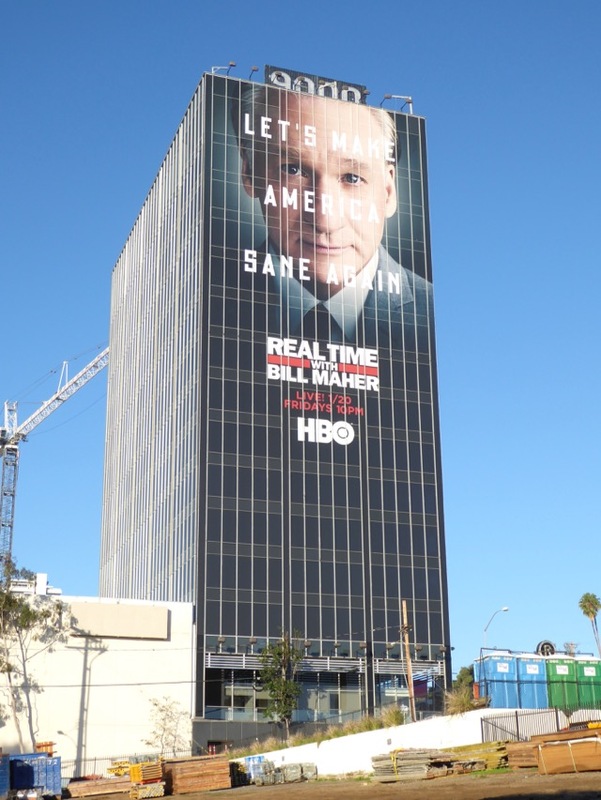 By the looks of things, more people will tune in to watch the return of Bill Maher's show than to actually watch the Inauguration today, which is sad. 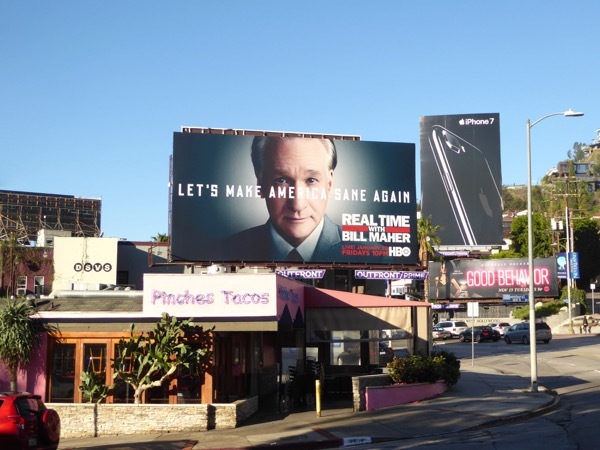 The standard landscape billboards for season fifteen of Real Time with Bill Maher were spotted along Melrose Avenue and Sunset Boulevard on December 27, 2016. Meanwhile the larger landscape and giant-sized versions were photographed along the Sunset Strip on January 14, 2017. 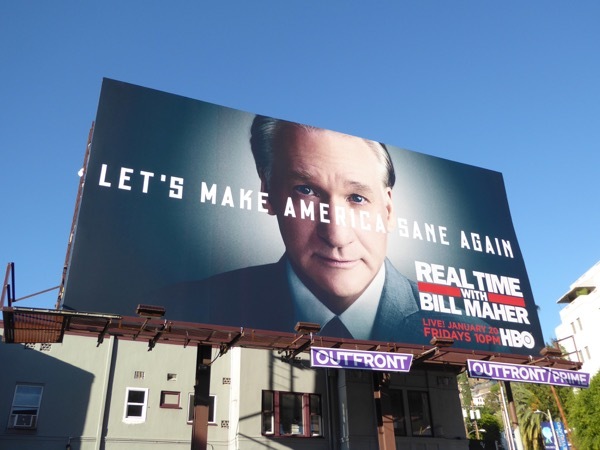 Fans of the outspoken and often controversial comedian can also enjoy these previous season promo billboards for Real Time with Bill Maher from recent years. 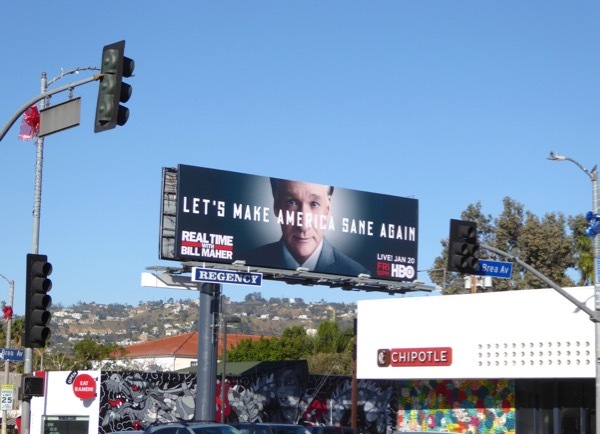 Today it's certainly the end of the world as we know it (for four years at least), but let's hope it's not literally the end of the world with a madman with the nuclear codes and Twitter at his tiny orange finger tips. 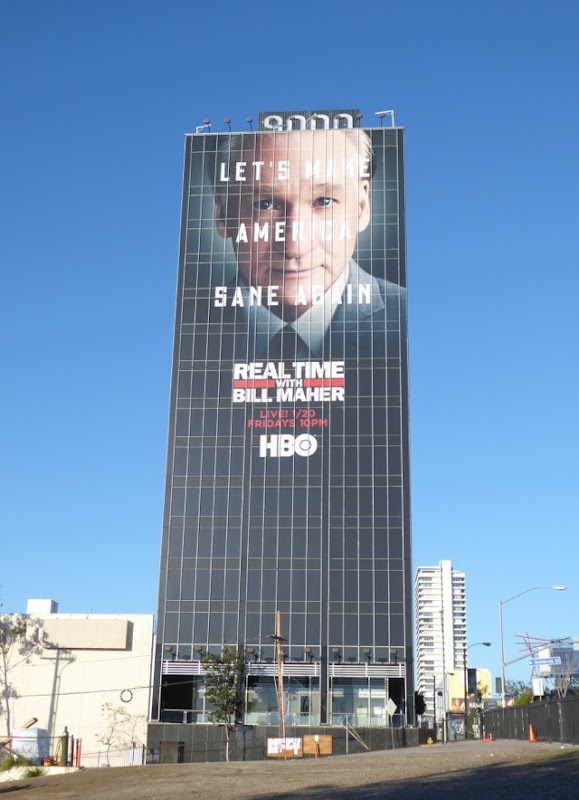 May whatever god you pray to have mercy on our souls. 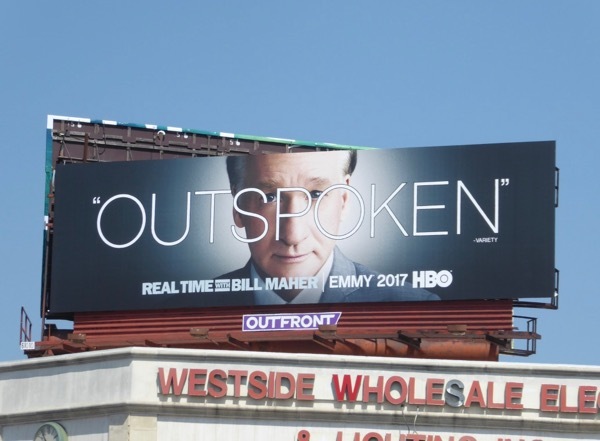 UPDATED: Here's also the Emmy consideration billboard for the 'Outspoken' host, snapped above Beverly Boulevard on June 3, 2017. 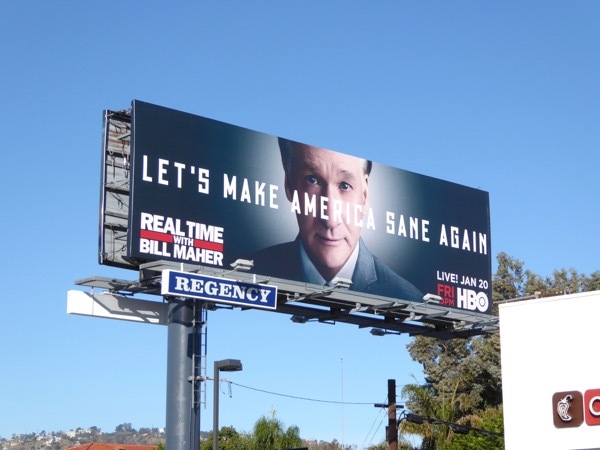 Just remember, speaking your mind doesn't allow you to make racist slurs against people.